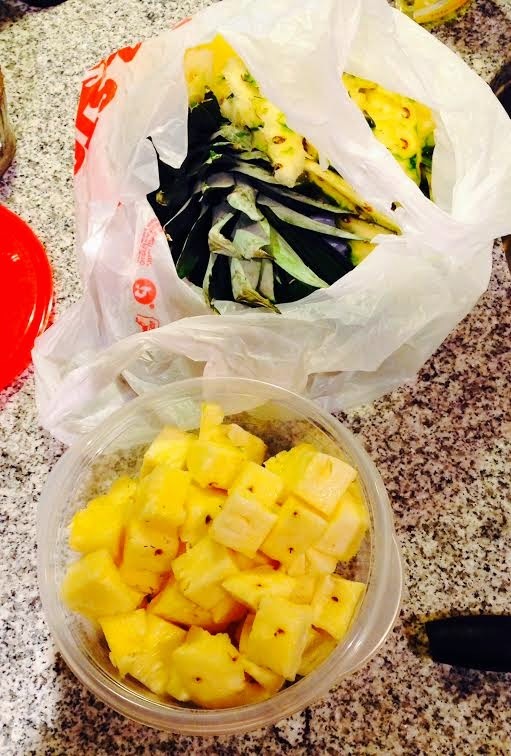 Pineapples are FULL of vitamins and nutrients (vitamin C, vitamin A, calcium, iron, some protein, and the list goes on)! They are great in juices, smoothies, on the grill, and of course alone. They are definitely one of my faves. 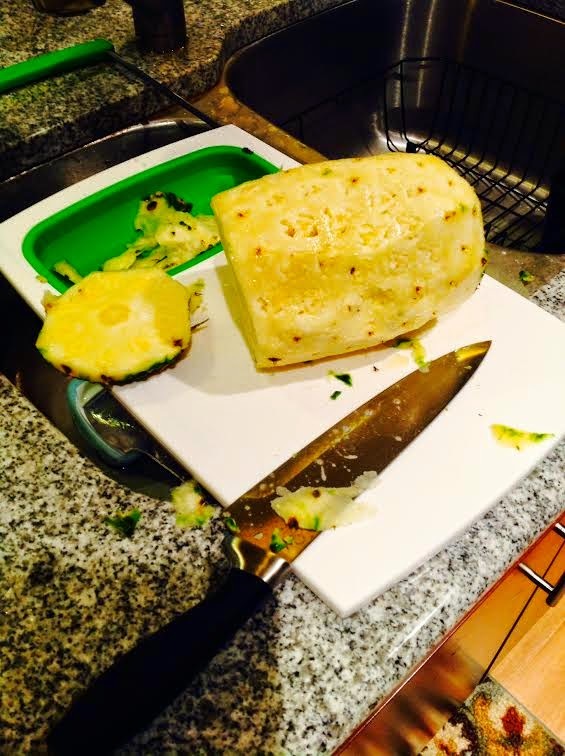 I thought I would write a quick post for all of you who want to know how to cut a pineapple. 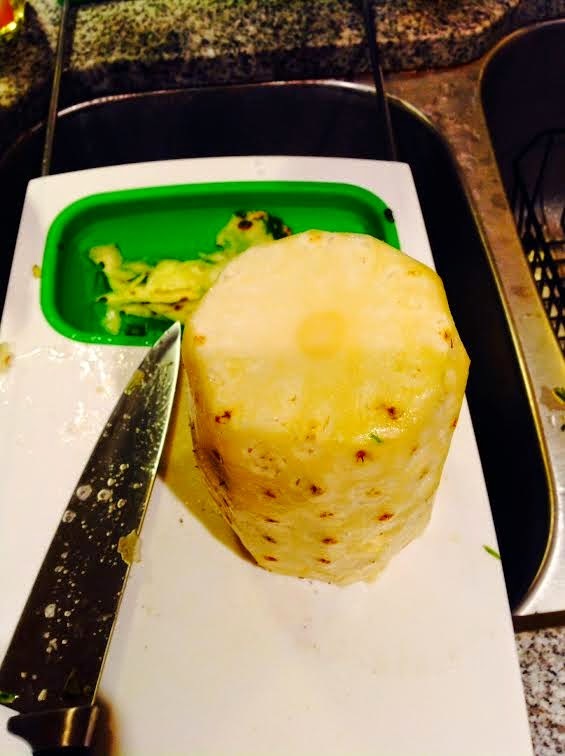 I actually learned this by watching a cooking video a while back and found it super helpful, but it didn't really explain how to cut it because the pineapple was just an accent of the meal. Soooo I took what I saw, tried it, loved it, and now happy to share it with you! I'm telling you, once you get the hang of it, you will never buy the precut kind again! 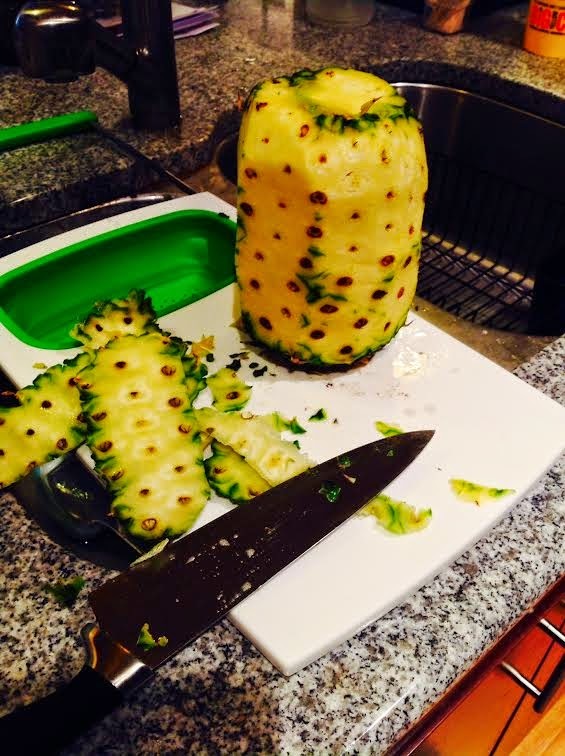 You get SO much out of one pineapple! BUT... I also know that they can be a bit difficult to cut too, so hopefully the way I show you will help! 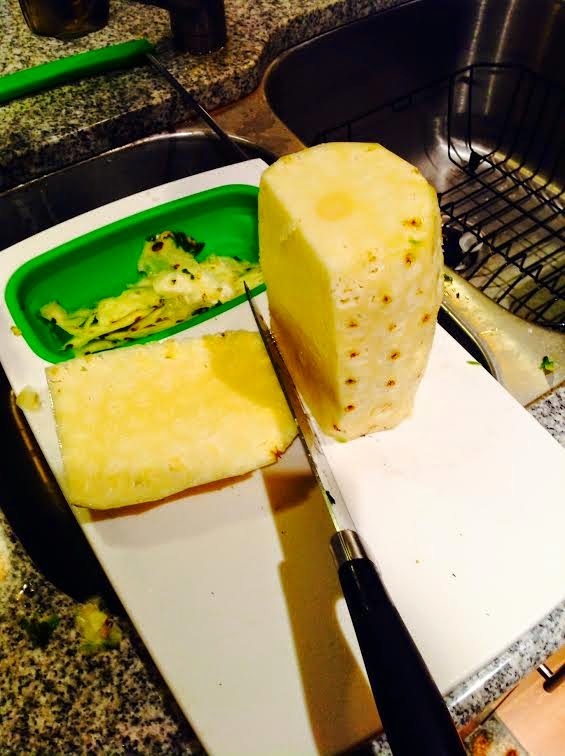 Maybe this is how everyone cuts a pineapple? I don't really know, but I'm sure I wouldn't have cut it like this if I hadn't have watched that video. But maybe some of you are like me, you would like to know how before guessing and jacking it up. 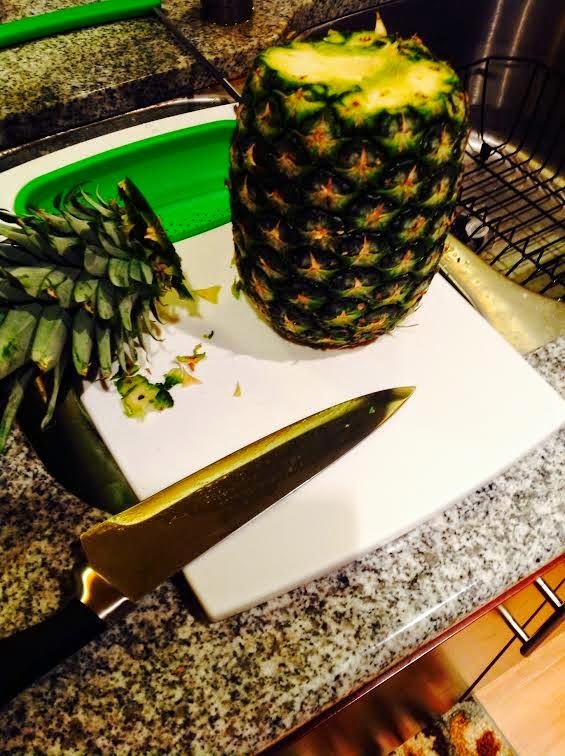 Take a ripe pineapple (aim for the greener ones with a little bit of a goldish color) and cut off the pointy, annoying leaves with a machete. Just kidding, a sturdy knife will do. 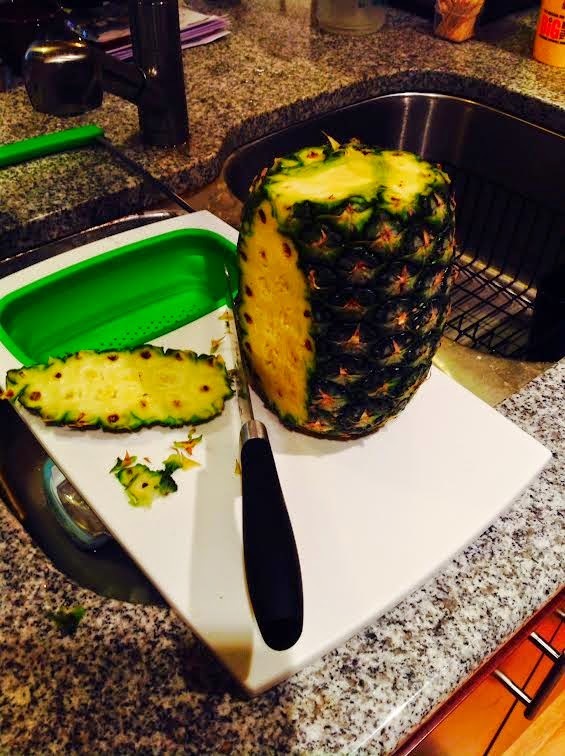 Set your pineapple back up vertically. Have a grocery bag or trashcan nearby. I usually throw the remains away as I cut. Start cutting the sides. I would advise you to start with thinner slices until you get the hang of it. Cut all the way around. 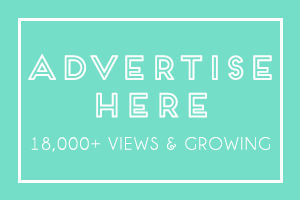 It should look something like this, but don't worry… it will be more naked soon. Okay, now you can get rid of the remaining spiky pores. Its okay if there are some brown spots left, but just try and cut off most of them. 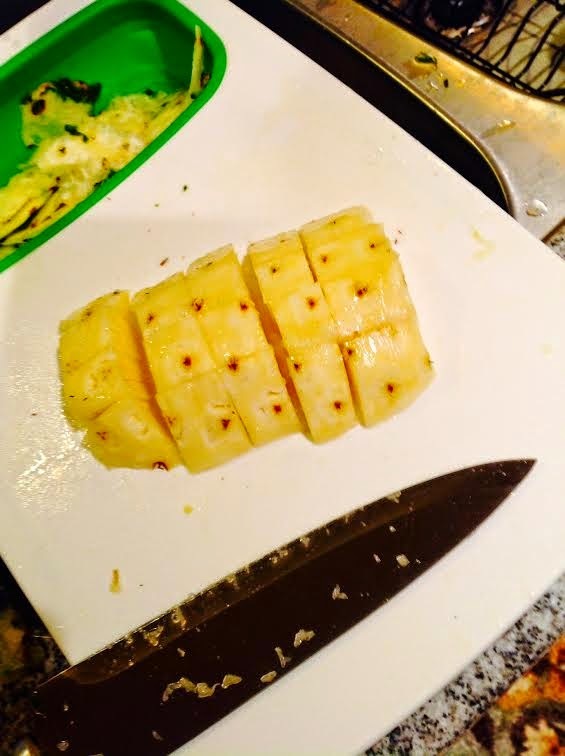 Now flip the naked pineapple on its side and cut off the cut top and the bottom that still have the green skin. Stand it up again. Okay, look closely. See that circular thing in the middle? That's the core. It's hard as rock and is supposedly filled with the most nutrients and vitamins. Well, I find it not very satisfying so I will be cutting around it. To go around the core, just simple cut the sides. I cut around it like it's a square, so I end up getting four pieces. So now I have four large pieces. You can probably get closer to the core if you want, but this is plenty of pineapple for me (The core is that piece standing up). Now for the fun and easy part! I cut the four large pieces into smaller square-like pieces. Here's a closer look at how I cut it. And walla! 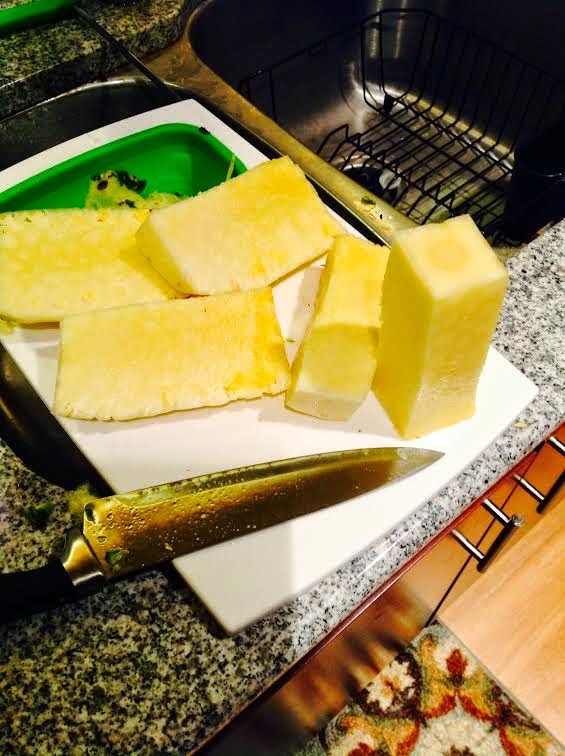 Freshly cut pineapple (and the bag of scraps). 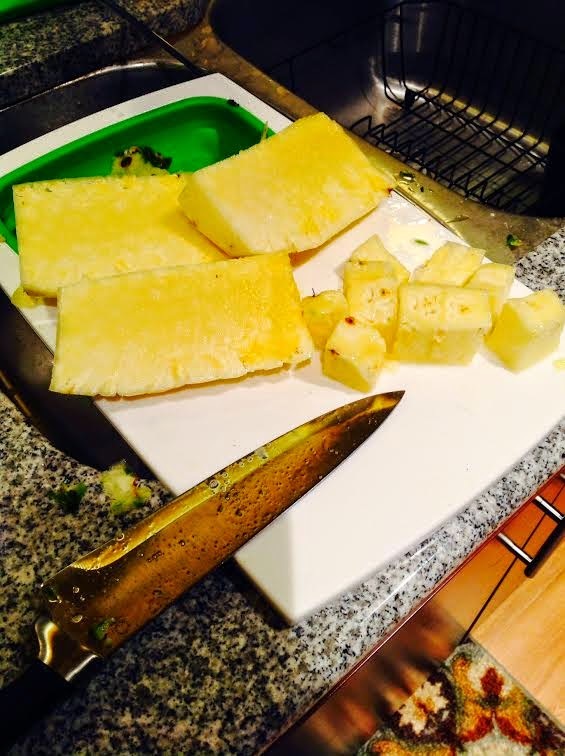 I hope you find these steps helpful when you are cutting your pineapple. I haven't timed myself, so I'm not too sure on how long it takes. The next time I cut one, I will look at the clock and post it. 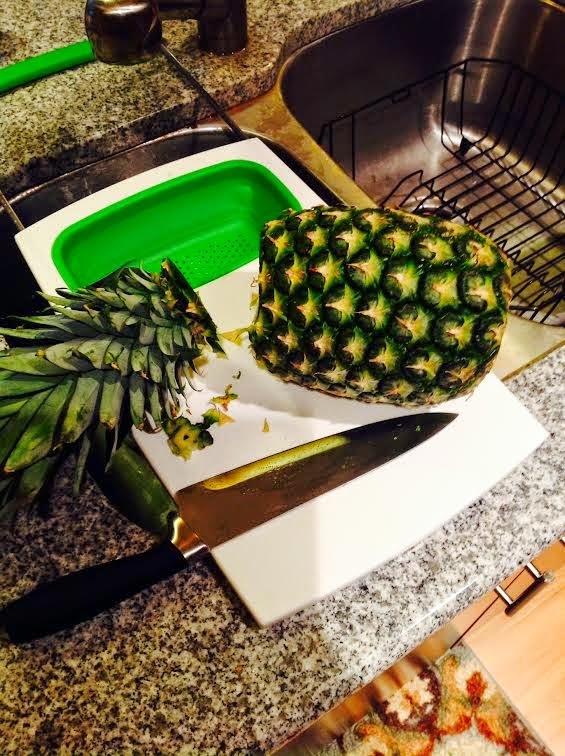 Also, try and cut your pineapple the day you buy it. 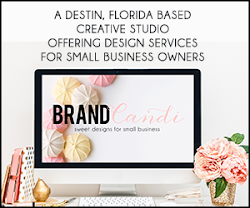 This way you don't forget about it (I'm guilty of that). Oh! 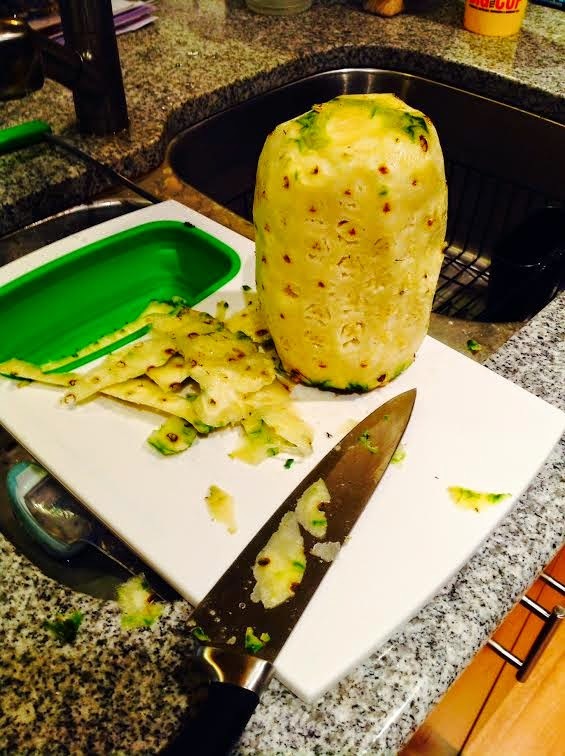 and if you are a juicer, you could definitely use the core piece in your juicing instead of trashing it. P.S. 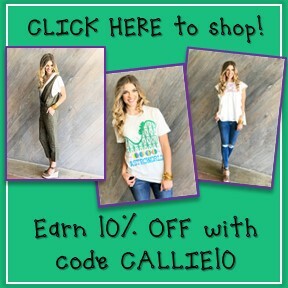 If you are doing the July goal challenge with me, I hope you're first day has been great!! I will post my day 1 results mañana!